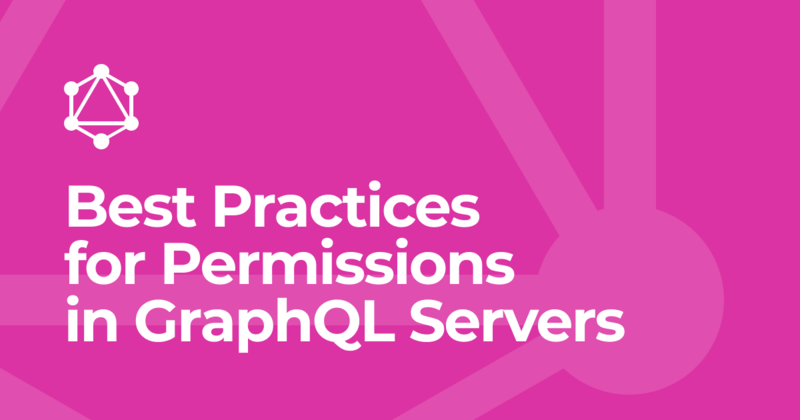 In this tutorial, you'll learn how to implement permissions rules when building a GraphQL server with Prisma and graphql-yoga. For the purpose of this tutorial, you'll use the node-advanced GraphQL boilerplate project (which already comes with out-of-the-box authentication) to get started. You'll then gradually adjust the existing resolvers to account for the permission requirements of the API. Let's jump right in! Before you can bootstrap the GraphQL server with graphql create, you need to install the GraphQL CLI. For the purpose of this tutorial you don't explicitly have to install the Prisma CLI because prisma is listed as a development dependency in the node-advanced boilerplate, which allows to run its commands by prefixing it with yarn, e.g. yarn prisma deploy or yarn prisma playground. If you have prisma installed globally on your machine (which you can do with npm install -g prisma), you don't need to use the yarn prefix throughout this tutorial. 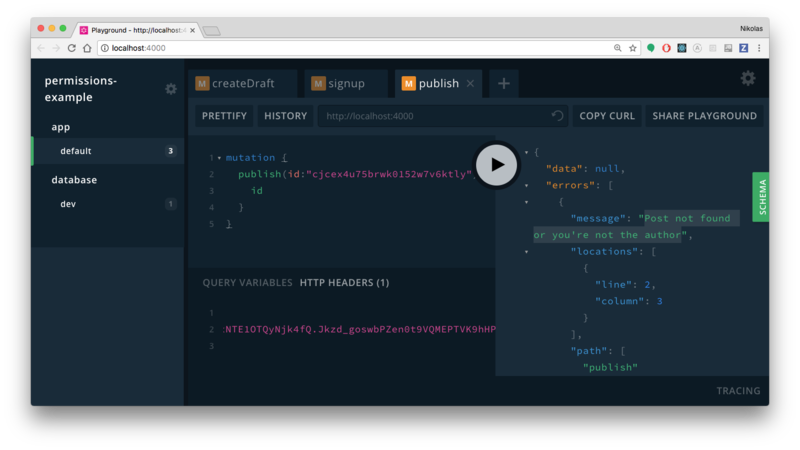 Once the CLI is installed, you can create your GraphQL server. In the output you'll be given a public endpoint which will look like https://eu1.prisma.sh/public-example-123/permissions-example/dev. You can also deploy the Prisma service locally, this however requires you to have Docker installed on your machine. For the purpose of this tutorial, we'll go with a public demo cluster to keep things simple and straightforward . This will create a new directory called permissions-example where it places the source files for the GraphQL server (based on graphql-yoga) and the required configuration for the belonging Prisma database service. In this tutorial, a User can be either an admin (with special access rights) or a simple customer. To distinguish these types of users, you need to make a modification to the data model and add an enum that defines these roles. Note that the role field is not exposed through the API of your GraphQL server (just like the password field) because the User type defined in the application schema does not have it. The application schema ultimately defines what data will be exposed to your client applications. To apply the changes, you need to deploy the database. Now your data model and the Prisma API are updated and include the role field for the User type. signup(email: String!, password: String!, name: String! ): AuthPayload! login(email: String!, password: String! ): AuthPayload! createDraft(title: String!, text: String! ): Post! feed: No permissions requirements. Everyone (not only authenticated users) should be able to access the feed of published Post nodes. drafts: Every user should only be able to access their own drafts (i.e. where they're set as the author of the Post). post: Only the author of a Post or an ADMIN user should be able to access Post nodes using the post query. publish: Only the author of a Post should be able to publish it. deletePost: Only the author of a Post node or an ADMIN user should be able to delete it. When implementing permission rules with Prisma and graphql-yoga, the basic idea is to implement a "data access check" in each resolver. Only if that check succeeds, the operation (query, mutation or subscription) is forwarded to the Prisma service using the available prisma-binding. You're now going to gradually add these checks to the existing resolvers. Since everyone is able to access the feed query, no check needs to be implemented here. In fact, this already accounts for the requirement because it filters the posts and only retrieves the one for the authenticated User. So, there's nothing for you to do here. Only the author of a Post or an ADMIN user should be able to access Post nodes using the post query. It's very simple and straightforward! But now, you need to make sure that it only returns a Post if the User that sent the request is either the author of it or an ADMIN user. You'll use the exists function of the prisma-binding package for that. If either of these conditions is true, you simply return the Post, otherwise you return an insufficient permissions error. Only the author of a Post should be able to publish it. The current exists invocation already ensures that the User who send the request is set as the author of the Post to be published. So again, you don't actually have to make any changes and the requirement is already taken care of. Only the author of a Post node or an ADMIN user should be able to delete it. Again, the exists invocation already ensures that the requesting User is the author of the Post to be deleted. However, if that User is an ADMIN, the Post should still be deleted. 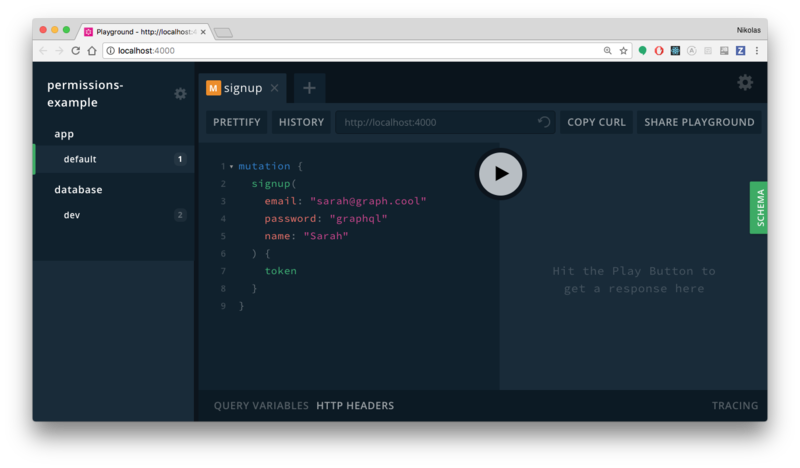 You first need to open a GraphQL Playground, but before you can do that you need to start the server! The server is now running on http://localhost:4000. From now on, all requests sent through the Playground are sent on behalf of the User you just created. Equipped with that knowledge, you can now play around with the available queries and mutations and verify if the permission rules work. Create a new draft with the createDraft mutation on behalf of Sarah (the User you just created). Create another User with the signup mutation and ask for a token for them. Use the new authentication token to try and publish Sarah's draft. This should return the following error: Post not found or you're not the author.